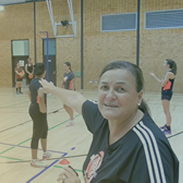 The coach feeds the ball to the forehand side of the player who stands on the service line. Player hits a forehand volley to the coach who stands in the middle of the opposite service line to the player. The coach then returns the ball to the player so he/she has to hit a backhand volley down the line. Place cones around 1 metre from the service line on the deuce side for the player to aim for. In this drill the player works on volleying all balls down the deuce and ad line. 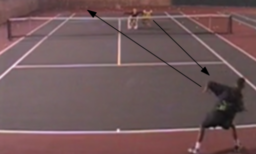 This exercise will develop a player's quick foot movement and control of the racquet. Emphasise the importance of staying on the side where the ball was hit to guarantee the player remains in the correct position at the net. Make the area between the cones smaller so as players get better they have a smaller area to aim for. net player scores the point.